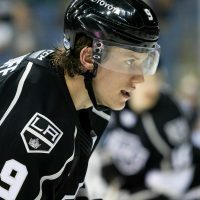 With the Manchester Monarchs season schedule about to get underway tomorrow, now is a great time to continue our bi-annual look at the Kings top prospects. Last week, we rolled out detailed write-ups on the seven prospects sitting just outside the Top 10 – Patrik Bartosak, J.F. Berube, Nick Ebert, Kevin Gravel, Zac Leslie, Roland McKeown, and Nikolay Prokhorkin. If you missed the Honorable Mentions article, it’s linked below for your reference. 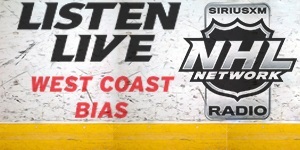 As we move into part two of the three-part series, we once again remind you that our final slotting of players was influenced by hundreds of hours of watching, talking and debating the team’s prospects with a myriad of well-respected hockey people, including our key sources inside the Kings organization. Without any further ado, we’ll begin the countdown in reverse order, starting with numbers six through 10 here, and then conclude the series later with the top five, including No. 1 overall. 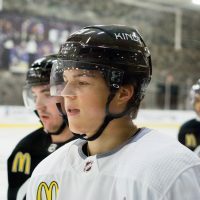 Weal is one of the more intriguing players in the entire Kings pipeline simply because he is an outlier, in terms of how the team has been built under GM Dean Lombardi. Already a dynamic offensive player in junior, he has dramatically improved his overall game the past two seasons. One of the things often noted is that he’s the second best player in Manchester nearly every night. The top player may rotate from game to game, but Weal just plugs along at a consistent pace. He possesses tremendous vision and hands capable of dazzling a crowd. While he is primarily a playmaker, don’t discount Weal’s ability to bury the puck himself. Another underrated aspect of his game is how competitive he is. The former Regina Pat has an endless motor and a penchant to deliver in clutch moments. While he isn’t a top defensive player, Weal is very shifty defensively and can often be seen lifting sticks, stealing the puck, and creating offense the other way for his team. He utilizes great skating to create offense on the rush. For all the positives, Weal at times can be easy to muscle off of the puck. However, as one scout noted to us, he could probably play on 15 teams in the NHL right now. Like Linden Vey before him, there just isn’t room for him in Los Angeles. Based on merit, which isn’t always the criteria, several internally have also told us he will be the next forward to get a call-up. Ultimately, like Vey, he will most likely be dealt to another team. The trick here will be not to marginalize his value, like what happened with Oscar Moller and Thomas Hickey. If they can ultimately flip him for a third round pick, it’s a win-win for everybody. After posting 15 goals as a first-year pro in 2012-13, he increased to 23 last year. Further, he more than doubled his point total from 33 to 70, ranking him fifth in AHL scoring. For good measure, Weal also led the Monarchs with seven power play goals and was ranked fourth on the team in plus/minus with a rating plus-28. 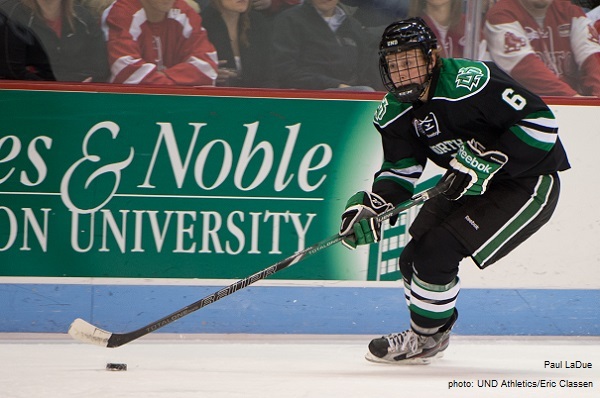 If you like defensemen, this is the kid you’ll want to keep an eye on this season. It’s not out of the question that he’ll be the biggest mover over the next six months and could even find himself ranked in the top three by season’s end. LaDue has the potential to be that good. More importantly, he just might be the exact player the Kings are looking for right now. If you want to tab him the MayorsManor sleeper, feel free, as very few outside the organization are hyping this kid at the moment. 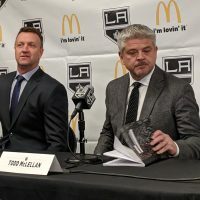 Followers of this site have heard plenty about the Kings’ desire to find another hybrid defenseman, ala Willie Mitchell. That’s a role that LaDue could possibly grow into. As a freshman last season at one of the country’s top college hockey programs, the hometown boy was one of their top players on the blueline – and that speaks volumes about his skill set, especially considering he was surrounded by a d-core that included five other NHL drafted players. Although they aren’t the same type of player, he’s ahead of where former UND defenseman Derek Forbort was at the same point. LaDue is also similar to another former college player, Alec Martinez, in that he plays a strong transition game and is very subtle in what he does on the ice. In a feature story I did on LaDue for LAKings.com near the end of last season, UND head coach Dave Hakstol praised the 6-foot-2 blueliner for his maturity, consistency, and ability to contribute offensively. When you add up all the attributes, he rates higher than nearly every other defensive prospect in the Kings organization. Like Nick Shore in the summer of 2013, expect LaDue to leave school early and come in ahead of schedule and then his stock will rise very quickly once the Development coaches get their hands on him. Remember, he’s had very little NHL structure in his game up until this point, as he’s only attended one Development Camp in LA. Be forewarned, if you tune in for just one game, you likely won’t come away thinking LaDue is great at any one aspect of the game. He’s not a punishing hitter. He’s not the fastest skater. He doesn’t have the hardest shot. While he isn’t super elite in any specific area, he’s good at everything. He wins battles along the wall, he moves the puck out of the zone well, and he does have offensive upside. Expect his raw skills to develop even further after he turns pro and gets to work with guys like Mike O’Connell and Nelson Emerson. No other player in the Top 10 has as many questions still to answer as Dowd. This isn’t because of any lack of skill, but more because the kid from Alabama just doesn’t seem like a likely NHL prospect. Regardless of who may think that, Dowd has more than pushed his way onto the list. Quietly, teams have been calling about the 24-year-old center since last year. As co-captain of the SCSU Huskies last season, he helped guide the team to their second straight NCAA playoff appearance, was named as one of the three finalists for the Hobey Baker Award (college hockey’s top individual prize), and led his team in goals with 22 (interestingly, another Kings prospect, Jonny Brodzinski, was second with 21). Scouts tell us that during camp in 2013, he and Michael Mersch were neck and neck on the organization’s depth chart and they’ve yet to separate themselves. Don’t misinterpret that though, it’s a compliment to the dedication each has put forth as they prepare for their first season of pro hockey this year in Manchester. Now the question is, will one advance beyond the other, or will they both excel and push each other, ala Tyler Toffoli and Tanner Pearson? All things being equal between Dowd and Mersch, we’ll take the left wing, as the Kings are deeper at center than any other position. Again, in a separate feature story I did on Mersch last season, Nelson Emerson commented, “Once the puck gets into the offensive zone, that’s when you see his assets come into play. He’s very strong along the boards. He wins the majority of his puck battles and when he’s in front of the net is when he becomes a real factor because he has a real touch and a real knack in that scoring area.” Yet another in a long line of recent college players to ascend up these rankings, Mersch appeared to avoid any transitional issues as he stepped up to the AHL for a short run after turning pro at the end of last season. Playing just 11 combined games in Manchester after finishing his season in Wisconsin, Mersch quickly found himself in a top-six role and playing on the power play. A true power forward, Mersch’s game thrives below the circles. Along the boards and in front of the net are the two places he can most likely be found. During his four years at Wisconsin, where former King Gary Shuchuk is an assistant coach, he improved his skating, but there is still room to grow, as Mersch can appear heavy on his feet at times. Listed at 6-foot-2, and with a stocky frame and an exceptional shot, he was the offensive weapon that drove Wisconsin. His 22 goals last season led the team, which also gave him the eighth most in the entire country. Already inseparable from Dowd, they even tied in goals last year. Now, they will be roommates this season in Manchester. Andreoff signed a one-year contract extension over the summer, but that’s hardly what you really need to know about his versatile forward. While some were trying to hype Adam Cracknell in training camp, there was one major problem – just like we told you all along, there was zero chance Andreoff wouldn’t make the opening night roster. Although these rankings had already been compiled by that point, we already had all the information we needed on this bruising player, who also has an affinity for tanning while in Los Angeles. Toughness is one of the first things that come to mind with Andreoff, and as former Monarchs coach Mark Morris once told us, he isn’t afraid to go toe-to-toe with anybody, any time. We’ve often referred to him as Kyle Clifford 2.0 (a riff on previously dubbing Clifford as Wayne Simmonds 2.0 when he was a rookie), but with a better scoring touch. This past year in Manchester, Andreoff posted 35 points (11 goals, 24 assists), a team-leading 133 penalty minutes and a plus-5 rating over 76 regular season games. He’s a quality defensive player who can be used at center or wing. Personally, we like him better at wing, but the Monarchs used him quite a bit at center last season. Regardless, he is destined to become a fan-favorite quickly in LA. He’s a well-rounded player who may lack enormous offensive upside at the NHL level, but has a unique ability to be a true pest for opposing teams to play against. Though he doesn’t drop the gloves as often as some may like to see, he doesn’t need to fight to get under the other team’s skin. Not everything in Andreoff’s game is about physical play. Even slotted in a bottom-six role in the NHL, he does have the skill to produce, including a very heavy wrist shot. 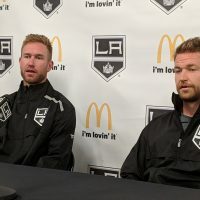 Don’t expect Andreoff to burst onto the NHL scene the same way Clifford did when he made the Kings out of camp in 2010, but look for him to play a much larger role by March and April. 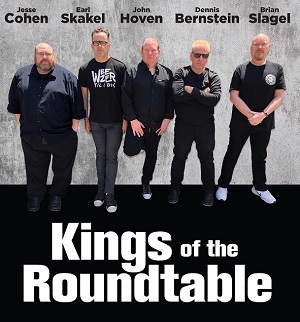 In the meantime, check out the linked articles below for more information on some of the Kings’ other young talent.